Can I qualify for SS disability with Kidney Disease? 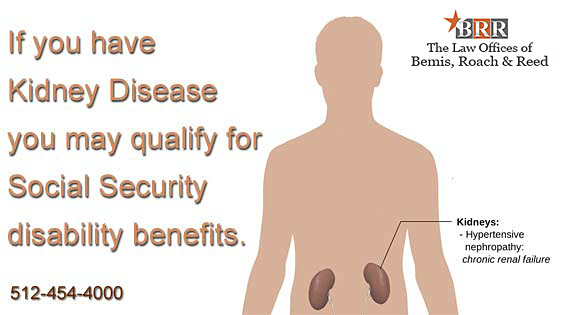 If you have Kidney Disease you may qualify for disability benefits. Kidney disease can make it difficult to work. Patients who require a kidney transplant are automatically eligible for benefits for the year after their transplant. Those who require dialysis are eligible for benefits after a year of dialysis treatments. Can I qualify for disability with Kidney Disease? Kidney disease can make it difficult to work. Patients who need a kidney transplant are automatically eligible for benefits for the year after their transplant. Kidney function deteriorates with age. Less than one percent of individuals under 40 have kidney disease while over a quarter of those over age 60 show early signs of kidney failure. The kidneys filter about 30 gallons of blood and produce 1-2 quarts of urine every day. There are a lot of different ways the kidneys can wear out, but the body will react in similar ways to reduced kidney function. Nausea, fatigue, mental cloudiness, swelling, itching and sleep problems are all common symptoms. There are several disorders generally lumped under the heading of “kidney disease”. Pyelonephritis is a bacterial infection of the kidney, Glomerulonephritis is an immune disorder that targets the kidney, polycystic disease is a genetic disorder that causes cysts in the kidneys, and cancer can also affect the kidneys. The most common type of kidney disease by far is chronic renal failure. Chronic renal failure is a progressive disease where the kidney slowly stops functioning. While alcohol, certain drugs, and diabetes can all speed up this process, the disease is almost always caused by aging. In contrast, acute renal failure is a rapid acceleration of this process. Acute renal failure can be caused by trauma, drug overdose, or dehydration. Even though loss of kidney function naturally occurs with age, it can be slowed or even reversed with a healthy lifestyle. Staying hydrated helps keep kidneys functioning properly. A healthy diet and exercise helps prevent high blood pressure, diabetes and other conditions that can put additional stress on your kidneys. Alcohol, tobacco and illegal drugs (particularly heroin and cocaine) are damaging to kidney function and should be avoided. Pain medications containing acetaminophen can also impair kidney function. One of the most frightening aspects of kidney disease is the lack of symptoms. Most people do not exhibit noticeable signs of kidney failure until the damage is irreparable. Experts predict many people are in the beginning stages of kidney disease and do not know it because they are not experiencing symptoms. There are objective tests that can measure kidney health through toxin levels in blood and urine, but doctors don’t know to run the tests if the patient doesn’t complain of symptoms. To complicate the issue further, the symptoms of kidney failure are vague and have a variety of potential causes- fatigue, nausea, problems with sleep and concentration. These symptoms generally don’t become severe enough to trigger a diagnosis until the liver is 60% destroyed. If you have been denied disability for kidney disease don’t give up. 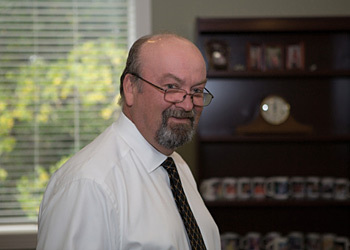 Contact the experienced Texas disability lawyer Greg Reed at 512-454-4000. When lifestyle changes fail to halt or reduce the symptoms, patients can have a machine take over the function of their kidneys. This is called dialysis. There are two types of dialysis- hemodialysis and peritoneal dialysis. In hemodialysis, blood travels outside the patient, through a filter then back into the patient. In peritoneal dialysis, a filter is placed inside the body, and a special fluid is pumped through the system to push blood through the filter. Peritoneal dialysis can be done at home. Some people do not like the idea of being depending on regular dialysis and opt to have a kidney transplant instead. Kidney transplants reduce the need for dialysis, but often encounter complications. Nearly a quarter of kidney transplants are rejected, resulting in the need for additional treatment. Kidney disease can make it difficult to work. Patients who require a kidney transplant are automatically eligible for benefits for the year after their transplant. Those who require dialysis are eligible for benefits after a year of dialysis treatments. The listing for kidney disease also includes specific creatinine clearance levels and blood pressure levels for those who have yet to receive a transplant or dialysis. The kidney disease listing is fairly objective and specific compared to most Social Security listings and an applicant with case of severe kidney disease is very likely to be awarded benefits. Contact a Texas Social Security disability lawyer at 512-454-4000 for a free consultation and see if you can get disability benefits for Kidney Disease. If you have been denied disability don’t give up! Two kidney diseases- Heptorenal Syndrome and Nephrogenic Systemic Fibrosis qualify for compassionate allowance. Compassionate allowance means that the claim is processed much more quickly than a standard claim. Additionally, applicants with End Stage Renal Disease can begin collecting Medicare immediately instead of having to wait the standard two years of receiving benefits. Kidney disease is a fairly objective thing to test for and in most cases, patients with kidney disease will easily qualify for benefits. However, the Social Security Administration rejects most initial claims. If your claim for kidney disease has been rejected, it may be necessary to appeal your claim. Appealing a disability claim can be confusing and time-consuming. If you do have to appeal for a denied disability claim, it is recommended that you get an Texas social security disability lawyer to help. 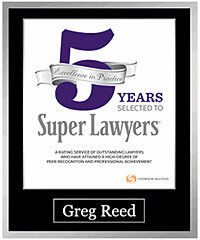 The attorneys at Bemis, Roach and Reed have experience winning appeals. 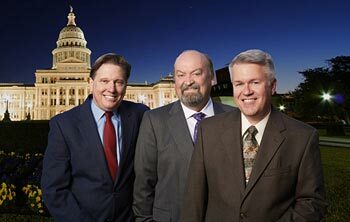 We are located in Austin, but serve clients throughout Texas. Contact us today for a free consultation. Call 512-454-4000 and get help NOW.